with a baby on the way a little bedroom reorganizing was necessary to ensure all children fit comfortably in our home. my daughters have been begging for over a year to share a bedroom because they love spending time together, playing together and of course sleeping together. they look at sharing a room as one never-ending sleepover and think it is a party every night. in order to put together their shared room i decided to turn it into their little escape to make this change as easy as possible on everyone. first and foremost i have to thank all the vendors who worked with me on this girl's bedroom redesign. 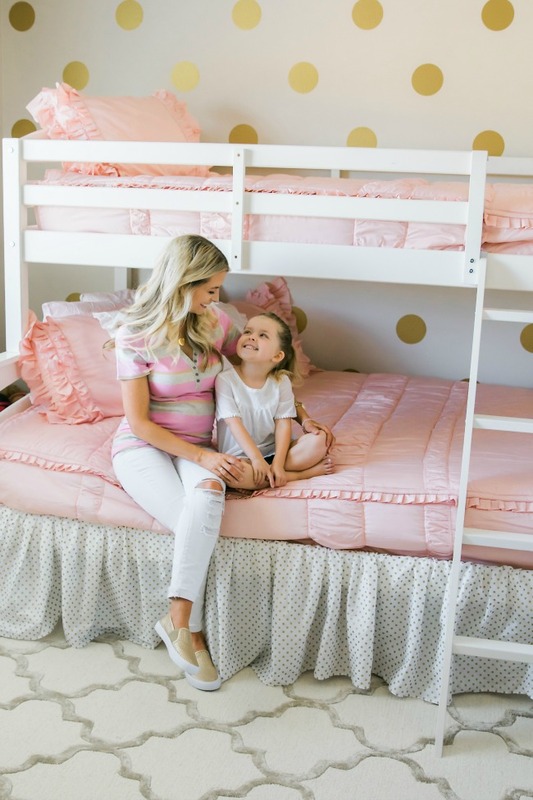 all have been so helpful and so great in getting the products to me in a timely manner and making sure my daughter's room was the best it could be. vendors include: Beddy's Beds, Minted, nuLOOM Rugs, Studio 378 Decals and of course my favorite photographer Danielle Torres Photography. 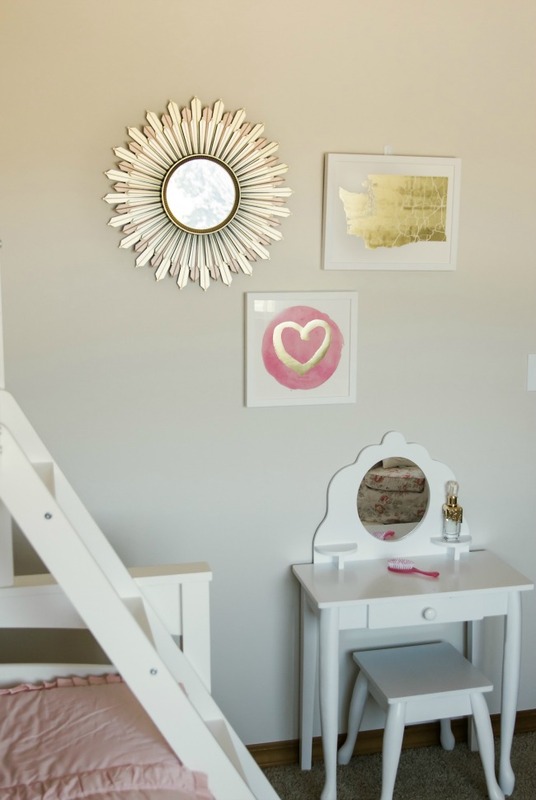 my first idea in this girls bedroom design was to create a space that was feminine and fun. my girls are playful, they love make-believe and can spend hours creating stories and plot lines from their imaginations. the first place i started with was the bedding. i had my eye on Beddy's Beds for a while. their bedding concept is incredibly smart. they create a comforter that fits on your bed like a fitted sheet would fit. 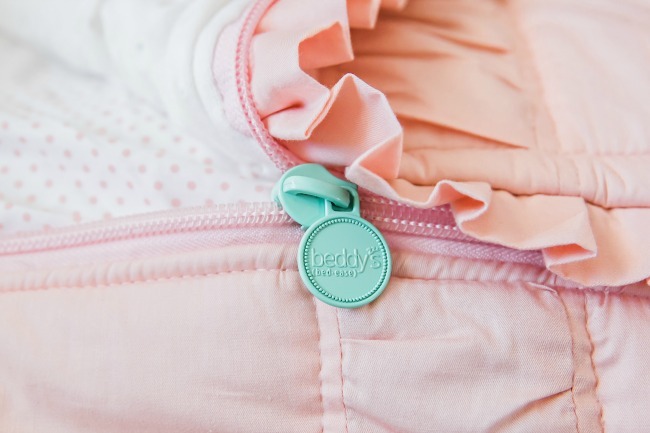 the sides of the comforter zip so that making your bed is simple and easy. the bedding interior is lined with mink to make it a comfortable sleeping blanket and the bottom sheet is built in. 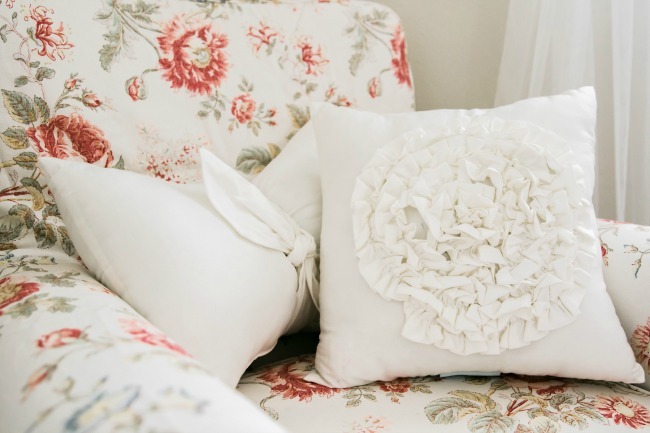 the fabric quality is amazing so that you don't have to worry about washing your comforter and wearing out the color. i specifically chose the Vintage Blush bedding. i selected this bedding to fit a twin size mattress and a full to match the new bunkbeds i had found for the girls. along with the Vintage Blush comforters i picked up the Chic White Pillow Set and the Always Enchanting White/Gold Bed Skirt to coordinate. i wanted to stick with colors that were neutral but had versatility and i felt white, gold and blush were the perfect combination for that. i absolutely adore my Beddy's bedding and i cannot say enough good things about this bedding. for children's bedding you just cannot beat the style, ease or design. 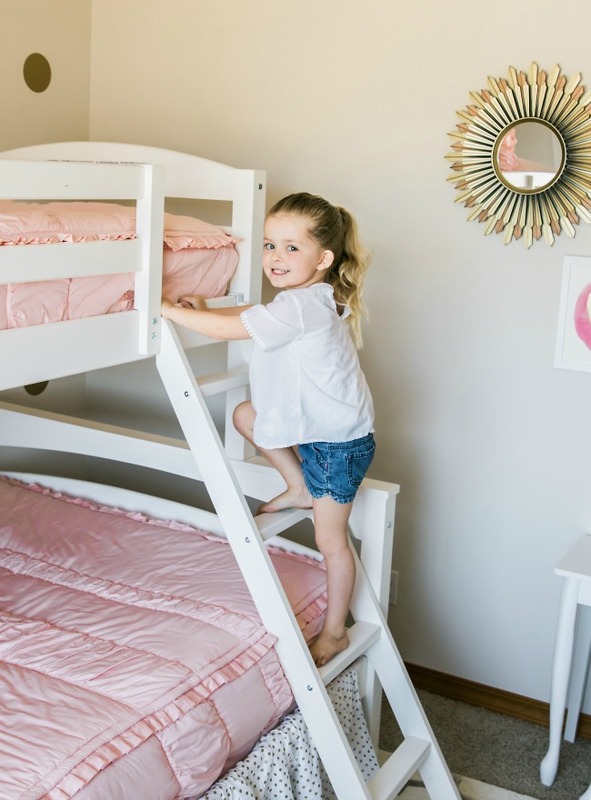 plus, if you have bunk beds you know what a nightmare it can be to make the bed everyday and the Beddy's design makes it easier than ever, even for my youngest! i am not a huge fan of painting the interior of my home but if you follow me on Instagram you know i love a good accent wall. one thing i knew i definitely wanted for this children's bedroom design was to create a polka dot accent wall. creating one that perfectly matched my bedskirt was an even better bonus! i headed over to Etsy to find a vendor for my Polka Dot Vinyl Decals and stumbled across Studio 378 Decals. they offer a ton of wall design options in easy to use vinyl decals. these vinyl decals allow you to create design that is as permanent as you want it to be. they are long lasting on the walls but are also simple to remove if you decide to change your mind. no worry about messy paint or potential stains or smears, these decals make design easier than ever. plus, Christy at Studio 378 Decals was so amazing to work with and great with costumer service. she helped me select the right decal and had it shipped to me so quickly. included were instructions on how to easily apply the decals along with tester decals to make sure you get it right. next on the girls bedroom design agenda was finding a coordinating rug. there is something about the perfect rug that adds such an element of chic design to a bedroom. finding the perfect rug can be a challenge. you don't want a rug that is inexpensive or cheaply made because it will be destroyed so quickly with the high volume of traffic in a bedroom. 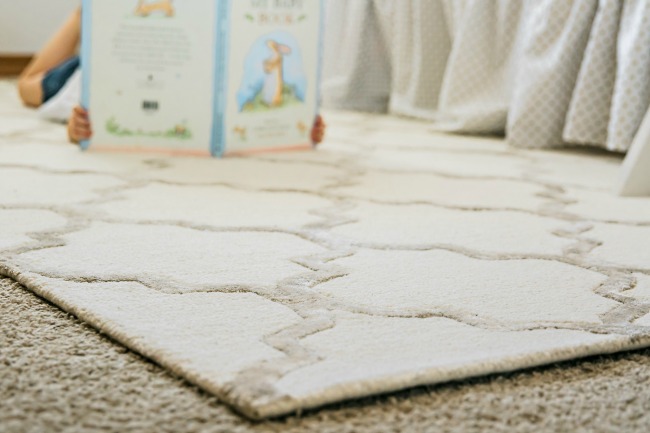 you also want a rug that is made with quality fibers so that it will wash easily in case your children decide to get a little messy. all these elements make finding the right rug essential. i used nuLOOM.com to find the perfect rug for my girls' bedroom. nuLOOM.com is a rug website that offers stylish, quality rugs at an affordable price. i stumbled upon this Park Avenue Trellis rug design while i was looking for the perfect accent rug and knew that it was just the right fit. the nickel colored trellis coordinates perfectly with the blush, gold and white color scheme and the off-white rug looks great with the beige carpeting. the carpeting on the rug is plush making it a comfortable option for lounging on. i couldn't have found a better deal or a better design for this room. last on my list for the girls bedroom design was to find the perfect bedroom decor. i wanted a few accent pieces that would work well for a child's bedroom but still look stylish and chic. i already owned this Jennylund chair from Ikea but i snagged this new chair cover on our last trip to Seattle because it was a perfect fit for the bedroom color scheme. it adds pops of color that coordinate perfectly with my blush, white and gold bedroom color scheme. i finished off the chair with the small pillows from the Beddy's Chic White Pillow Set. i added some sheer curtains to the wall even though i already had white wooden slat blinds. the sheer curtains add some feminine style to the window and the gauzy look has such a dreamy feel to it. i picked these sheer curtains up at Ikea as well for approximately $5 dollars for the set. not a bad way to spend $5. i adore this picture of my little miss enjoying her new bedroom. she told me that this was everything she ever dreamed of. hearing that from your children feels so rewarding! i wanted to make sure i finished off the room with art work that not only reflected how i felt about them but would also be a reminder of how much they are loved. i headed to Minted.com to find the perfect wall art that was unique in design and would also encompass beauty, emotion and style. my first selection was this Love You art print. i absolutely adored the print and its message letting the girls know i LOVE LOVE LOVED them. i selected the beige color that coordinates with the blush/white/gold color scheme perfectly. i wanted one extra large print to add strong design to the room and this was the one i selected. i hope every time they see this print they are reminded of my love for them. i loved the small touches that Minted.com adds by allowing you to customize the colors of the print along with the framing options (there are tons!) and the artist signature on the print. it makes the print feel exclusive in design and not overused. 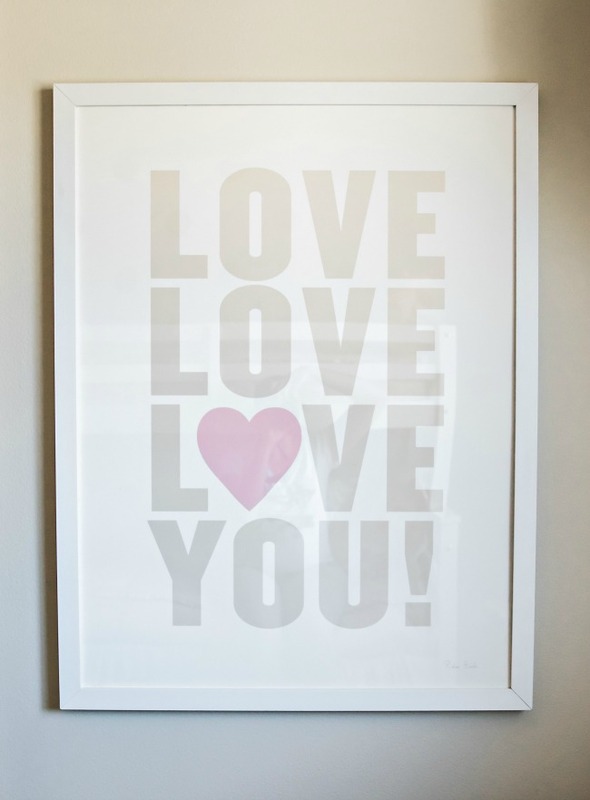 along with the Love You art print i selected the Brushed With Love foil heart print. i liked how the pinks coordinate with the rooms color scheme and the foiled heart ties in well with the gold polka dot accent wall. i put together a little wall art collage with the Brushed With Love foil heart and the Washington State Foil pressed print both from Minted.com. 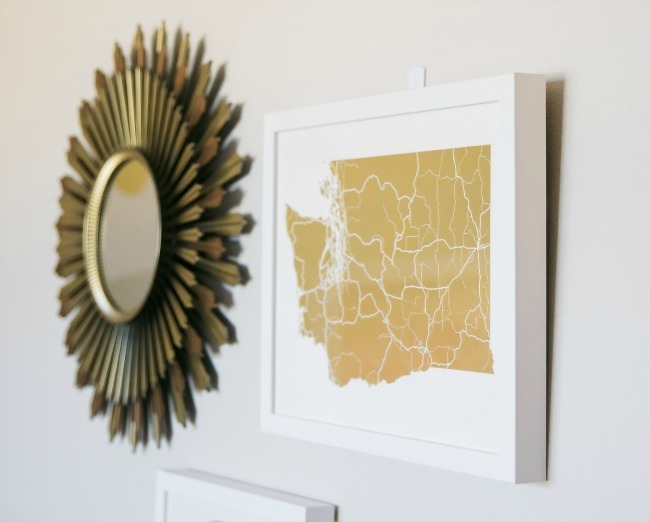 the foil pressed state prints come in every state available and i liked how it was such a unique way to add a personalized touch to the room. when looking for 3M strips to hang all of my art work i stumbled across this small starburst mirror and thought it made the wall art collage collection complete. i love spending time putting together a bedroom design that my girls would love. coming up with design ideas for their bedroom put my creative juices to work and my ultimate goal was to create a space they truly loved. please let me know if you have any questions about any of the items featured and i am happy to answer.